And by they, I of course mean your relatives at your long weekend cookout (just kidding–I’m talking about keeper stripers). Just when we were starting to get nervous, big fish pushed into our Bay last week. The fishing has been straight out. 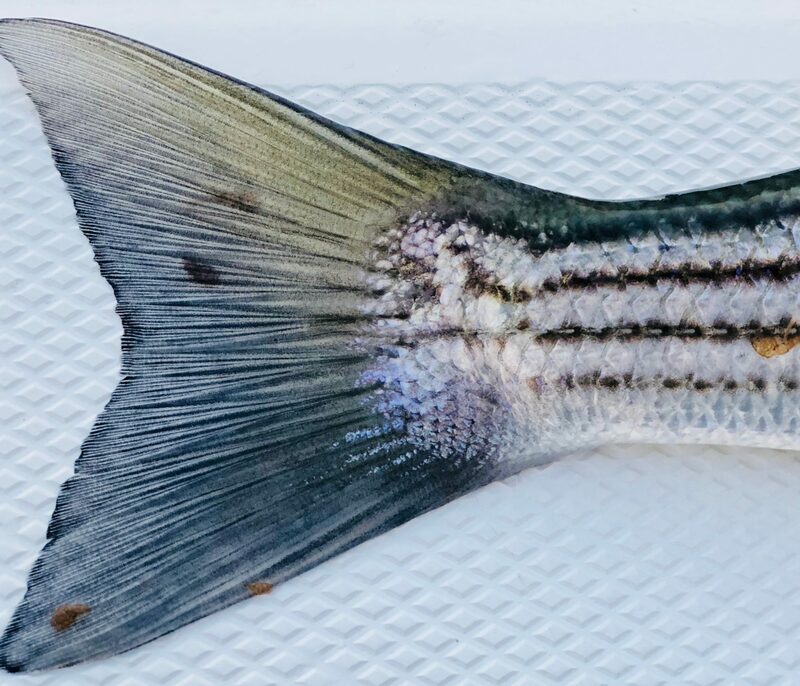 If I didn’t have a job and other obligations I think I’d probably be sick of catching our striped friends right now (ha, kidding again, that’s impossible). The West End of the Canal and the adjacent river mouths and bays has been the hot spot for stripers the past few weeks. Fish up to 36″ have been reported feeding on juvenile herring and other small bait. Most morning have featured heavy doses of topwater action. Guppy, Doc, and other spook-style plugs have gotten the most hits. The fish made it through the canal and have invaded Cape Cod Bay, especially Barnstable and Plymouth/Duxbuy. Both locales are seeing more heavy topwater action–mostly schoolies, but there have been small keepers mixed in. Nothing huge yet, but they’re on the way. You know what’s a fun way to fish if you have a kayak and want to feel like you’re sight-fishing for bonefish? Launch out of either Plymouth or Barnstable on the dropping tide. Paddle out to a sandbar that has access to some deeper water and a strong current. As the tide drops, beach your kayak, and spend low tide wading the flats, sight-fishing for stripers. The fish can sometimes be seen “tailing” in the shallows. It’s very cool. This can be a light tackle anglers dream if the conditions are right. For fly anglers, clousers, deceivers and crab, shrimp or sandeel patterns will be most effective. For spin anglers, you cannot beat a weightless 9″ hogy in white or bubblegum. This is what I would throw. Billingsgate, Race Point, and the Backside all got their fair share of fish, although these reports–especially Race Point–seem to be a week or two delayed, as the early adopters to that space don’t generally like to turn that spot into a parking lot until until mid June. Who can blame them? But if you’re not a report chaser, head across to the Race and make your own report. Just keep an eye on the weather. We’ve got some nasty stuff in the forecast that could make for a wet ride back. I have reason to believe that the stray 20+ pound fish have either passed through the Canal or worked up the backside of the Cape and are a day or two away from inhabiting your favorite rip at the tip of Old Cape Cod. A West wind should get them eating. I’m going to lump both Haddock and Black Sea Bass in the same category, because I have pretty much the same thing to say about both fisheries at the moment–it’s hot. Haddock have periodically moved down to the SW corner, but the majority of the biomass still remains mid-bank. Black Seabass can be found at any rockpile in Buzzards Bay. Bird Island has been hot (duh) for big knot-heads. Upsize your offering to cull out the smaller fish. E Wind around 15kt with gusts as high as 21kt. A chance of showers. Seas 3-4′. ENE Wind 7-10kt. A chance of showers. Seas 3-4′. E wind 6-9kt. A chance of showers. Seas around 3ft. So many options! Who else is feeling a little bit paralyzed by the amount of options we have? While the weather doesn’t look ideal, there should be plenty of protection to be found in the Bays for at least one day this weekend. Take the kayak out of the Wareham River during the dropping tide, and cast topwater plugs and flies to stripers. The biomass of fish arriving at the West End will often make a left turn and head into the river to feed. There has been an insane amount of fish in the river lately–it’s just tough getting them to eat anything. Take the boat out of Plymouth, load up on macks, drift the rips for keeper stripers. I may throw a few flies while I drift. Even though we haven’t heard of any really big fish in the “Three Bays” yet, I’m confident they’re there. Saturday morning is a good day to stay in the Bay and fish the same way I’m going to tonight. Here’s what we’re looking at for wind at 5am. I hope this dies down, but even if it doesn’t the SW wind should get the fish biting on the incoming tide. Nothin’ like some topwater in the snot. The rest of the weekend will be dictated by the (hopefully changing) wind forecast. If we get any window, I’m going to get in on that hot black seabass bite. I’ve been dreaming of throwing a few of those on the grill whole for the Memorial Day festivities.